Ambria M. Berksteiner, the reigning Miss Black Savannah USA, is the founder of Operation Changing the World One STEM at a Time Inc. (EST. 2016). Berksteiner was honored and acknowledged by Mayor Eddie W. DeLoach as a leading STEM Ambassador for the City of Savannah. Berksteiner was recognized for her dedication and devoted time to mentoring and stimulating the minds of students from elementary to high school in the Savannah area. Miss Berksteiner has worked diligently to expose underrepresented students to different areas of the STEM fields. Operation Changing the World One STEM at a Time Inc. was launched in 2016 while Berksteiner attended Spelman College. Berksteiner created the organization to provide mentoring to young African American Girls who are interested in pursuing STEM-related careers. Miss Berksteiner captivates their attention by incorporating STEM concepts with Visual Arts concepts, making an outwardly boring subject to some enjoyable through imagination and creativity. As a product of the Savannah-Chatham County Public School System, and as a graduate of The Savannah Arts Academy, Berksteiner is a participant of the Dual Degree Engineering Program at Spelman College, where she majored in Mathematics, and is currently pursuing a degree in Industrial Engineering at Auburn University. Berksteiner is planning on obtaining her Ph.D. in Industrial Engineering. Miss Berksteiner’s esteemed position as a Spelman Alumna STEM Ambassador, member of the Executive Board of the National Society of Black Engineers (Auburn University Chapter), and recipient of the Georgia Power Women in Engineering Scholarship, displays her exemplary service as an advocate for the STEM fields as well as the arts, adding pride to the citizens of Savannah. Berksteiner believes that creativity is key and that it should be cultivated at an early age. This summer, Miss Berksteiner held Operation Changing the World One STEM at a Time at Gadsden Elementary and Gould Elementary, with students from the 21st Century Enrichment program. Miss Berksteiner believes that. Diversity in the classroom and workplace is very much needed to advance scientific knowledge and expose it to our youth.” Throughout the week, Berksteiner exposed the students to engineering and mathematical concepts through building and structure. Also, the students were asked to observe themselves, with Berksteiner frequently asking. What is the Hypothesis of their Life?” The students will be showcasing their designs and creations at Gadsden Elementary on Friday June 29th, at 10am. By shining a spotlight on the valuable experiences and knowledge that African American women bring to STEM, Miss Black Savannah USA has and continues to model for young ladies what it means to be a modern-day woman in STEM, displaying that engineering is vast and diverse. 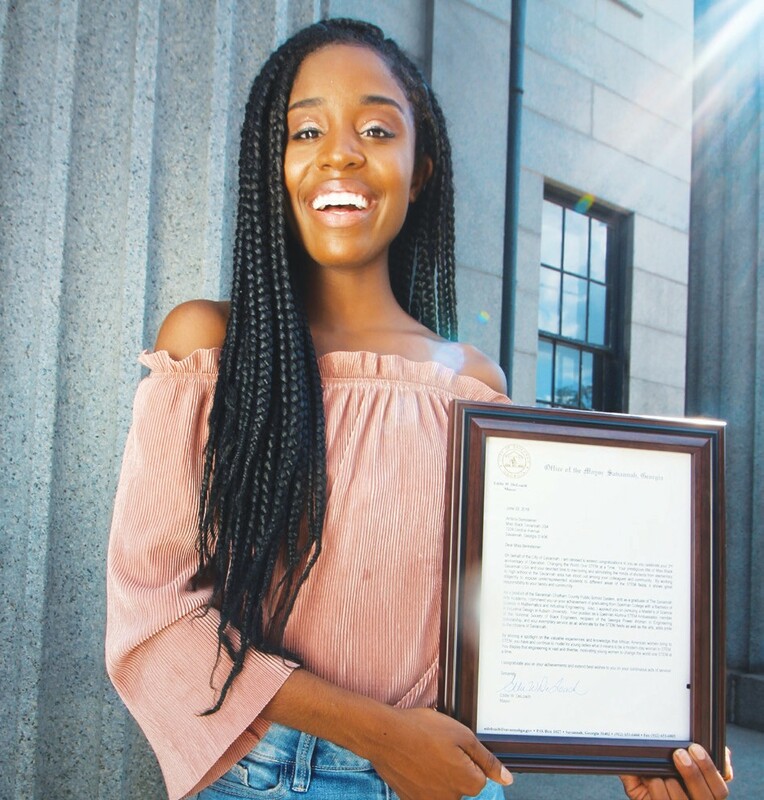 This honor is only the beginning for Berksteiner, as she continues to motivate young women to change the world one STEM at a time. To learn more about Operation Changing the World One STEM at a Time and how you can bring the organizations to your school or program contact Berksteiner by email at berksteinerambria@gmail.com or by the Operation Changing the World One STEM at a Time Instagram page (@operationonestematatime).